I am pretty proud of my accomplishments over the past week! I do not have a scale at this point to keep record of pounds lost, but I know if I adopt healthier habits, that I will lose weight, feel more energetic, and be healthier. My goal for this past week was to drink 16 ounces of water per day. I drank more water in this past week than I probably have in the past 6 months combined. I am hoping to continue that trend until it becomes habit. The other thing that I started to do this past week is counting calories. I downloaded an app on my ipad with a barcode scanner and a fit has made my life a little easier. I have gone over my calorie allotment a few times and know what I need to change. I hope my update next week is that I accomplished the one goal I set then I can keep the same goal and set other ones! What are some of your weight loss goals? 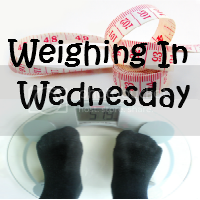 If you would like to join up for Weighing in Wednesday, the rules are quite simple. Write a post about your weight loss goals, dreams, successes, or whatever you would like to write about as long as it pertains to weight loss. Cheer other WIW participants on and together, we may be more successful! If you want to grab the button, I'd be happy, and if you don't, I'll still read your post. Please link up so I can support you!